The international media that supports the strategists of capital have been delighted at the news of the death of Venezuela’s socialist president Hugo Chavez. And they are now predicting the quick demise of Chavez’s government and political movement, either by defeat in the ensuing presidential elections or by some ‘popular’ uprising against his ‘autocratic’ and ‘dictatorial’ rule. We’ll see. Over the last 14 years, Chávez submitted himself to fourteen national votes, winning thirteen of them by large margins, in polling deemed by Jimmy Carter to be “best in the world” out of the ninety-two elections that he has monitored. And in the last presidential ballot, which Chávez won with the same percentage he did his first election yet with a greatly expanded electorate,even his opponents have admitted that a majority of Venezuelans liked, if not adored, the man. And why was that? Well, we have to go back to before Chavez. Venezuela’s economic fortunes are tied to world oil prices. Petroleum prices began to fall in the mid-1980s. Venezuela had grown lopsidedly urban, with 16 million of its 19 million citizens living in cities, well over half of them below the poverty line, many in extreme poverty. In Caracas, as in many other Latin American countries, poor people lived, cut off from municipal services. The spark came in February 1989, when a recently inaugurated president who had run against the IMF said that he no choice but to submit to its dictates. He announced a plan to abolish food and fuel subsidies, increase gas prices, privatize state industries and cut spending on health care and education. That’s when opposition to the rule of Venezuela’s rich, in league with American imperialism and the IMF, began. When Chavez finally came to power he promised broad reforms, constitutional change and nationalization of key industries under his so-called Bolivarian Revolution. In some ways (but not all!) that was no more than even right-wing governments had done. After all, a real vicious dictator, General Pinochet of Chile, who led a coup to overthrow the democratically elected President Allende with the backing of the CIA back in 1973 that led to thousands of deaths and ‘disappearences’ had also presided over the nationalisation of Chile’s key asset, the copper mines – and they remain nationalised to this day. Like the PDVA, the state oil company in Venezuela, Chile’s Codelco is a major contributor to the government coffers. Codelco pays income tax, all dividends go to the government and it also pays a 10% tax on the export value of copper products. Venezuela, rich in natural resources and with one of the largest oil and mineral reserves in Latin America and the Caribbean, is also a country with huge potential to reach sustainable economic and social development. Chavez’s programmes, aimed at helping the poor, included free health care, subsidised food and land reform. This succeeded in decreasing poverty levels by 30% between 1995 and 2005, mostly due to an increase in the real per capita income. Extreme poverty diminished from 32% to 19% of the population. A recent IMF report (http://www.imf.org/external/pubs/cat/longres.aspx?sk=40024) showed that the gini coefficient (a measure of inequality of income between the top and bottom income earners) in the US had jumped from 30.5% in 1980 to 38.6% in 2010, the largest rise in the whole world with the exception of one country, China, where it has risen from a relatively low 28% to a very high 42% during ‘the move towards the market’ in China over the last 30 years. The most equal society in the advanced capitalist world is Norway (24%), which is also the richest. All the Scandinavian ratios are relatively low while Germany and France are in the middle (low 30%). Only the UK at 33.5% is close to the US – the rise since 1980 in the UK has matched that of the US, making it the most unequal society in Western Europe! But there was one country that has become more equal over the last 20 years – Venezuela. And all that improvement was under the presidency of Chavez, with the gini coefficient falling from 45.4% in 2005 to 36.3% now. Venezuela is now the fairest country in Latin America on this measure. Brazil maintains its status as the most unequal, while South Africa with a hugely rich tiny white minority has the infamous status of being the most unequal country in the world (63%). Oil gives Venezuela a competitive advantage in international trade. But it also throws the domestic economy off balance, as it accounts for more than 30% of the gross domestic product (GDP), approximately 90% of exports and 50% of fiscal income. When Chavez first came to power, the price of oil was less than $20 a barrel; by 2006, it was more than $60 and rising. Chávez was able to pour money into social programmes and engage in a burst of petrodiplomacy – subsidising like-minded governments not only in Cuba but also Bolivia and Nicaragua. Even many poor Americans benefited from aid from Venezuela. When the US Congress decided to cut 25% from the Low Income Home Energy Assistance Program, Citgo Petroleum Corporation, a subsidiary of Venezuela’s state-owned oil company, said that it would be continuing its six-year-old program of providing heating oil to poor Americans free of charge. What does the future hold for Chavismo? Any new government will be desperate to sustain revenue and to see oil prices remain as high as possible. The power to achieve that, however, lies elsewhere and in economic terms Venezuela is a price taker. It must deal at whatever price the market sets and in the end that means relying on the Saudis to maintain Opec discipline. Venezuela’s relative isolation has meant that the currency, the bolivar, had to be devalued in order to sustain dollar-based oil exports. 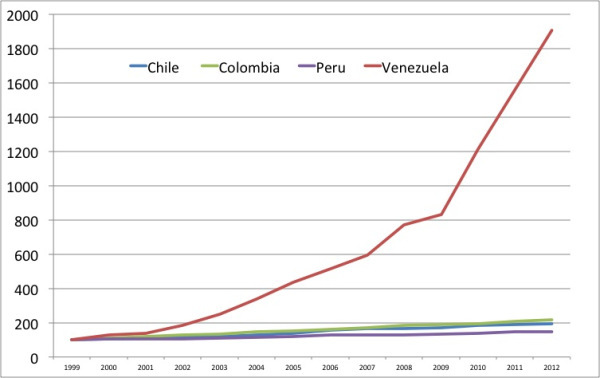 More dollar revenues had a price, inflation spiralled, way more than in other Latin American countries (see the graphic below of inflation since 1999). That hit the savings of the middle-class, in particular. As a result, significant opposition to Chavismo has been maintained, even among relatively lower middle-class strata. And in the last couple of years, oil revenues began to mark time, forcing Chavez to cut back on government spending and devalue even more. As a result, living standards stopped rising and social problems (especially crime) began to erupt. Also, investment in extracting the massive oil reserves has been lacking, partly because foreign investment and expertise have been absent. This is the blackmail card that international capital has to play. ‘We shall invest, if you end Chavismo’ and return to being a compliant oil producer for American energy needs (Venezuela is America’s biggest provider of foreign oil). It remains to be seen how the Vice-President Maduro and the Chavistas deal with this blackmail. We can only hope that the spirit and determination of Hugo Chavez will prevail. This entry was posted on March 6, 2013 at 7:28 pm and is filed under capitalism, economics. You can follow any responses to this entry through the RSS 2.0 feed. You can leave a response, or trackback from your own site. First is his role apparently balancing between the classes. In many ways, it was similar to that of the old Lazaro Cardenas. It seems this role is not generally considered. Second is the fact that all the reforms he brought about – and they were many and important – were based in the end on Venezuela’s vast oil wealth. But this is exactly at the time that the single most important crisis facing the planet is global warming, due to burning of fossil fuel. Chavez’s role left him unable to deal with this contradiction. I have found that article of yours archived. But the original site of the daily censored has been suspended. I can’t seem to find why. Do you still write, and if so where? Michael. I’m sorry but I always considered that Chavez was another caudillo. The big problem for Venezuela is the vast expansion in Shale Oil and Gas. of course the Neanderthals will try and stop the drilling but they will fail. Look at http://geology.com/articles/marcellus-shale.shtml to see the number of wells just in the Marcellus basin per year. It is estimated that 16,000 wells were drilled last year and that with Octopus technology that will vastly increase. The US will be a net exporter of oil and gas in 2015, so Venezuela will have great difficulty in finding markets. And although the Chinese have just had bad luck drilling just off Cuba looking for tight oil they will succeed soon. The U.S. already is a major exporter of oil and gas — most of what is produced in Alaska, for instance, is exported to East Asia. In fact, the U.S. was a net exporter in 2011. (http://www.bloomberg.com/news/2012-02-29/u-s-was-net-oil-product-exporter-in-2011.html) The idea that the U.S. will soon not need Venezuelan oil is a right-wing fantasy. And what can we do but smile indulgently at the description of people who struggle in favor of clean water and environmental sanity as “neanderthals.” The real issue is that Venezuela uses its energy resources to — gasp! — to better the material conditions of the Venezuelan people rather than swell the bloated coffers of multi-national corporations. That is what the bitter opponents of Hugo Chávez hate. As I pointed out in my article (see above), I think Chavez balanced between the classes. In this sense, he was a bonepartist. He most certainly did not have a base in the capitalist class. He had a lot of support in the working class, but to be really based on the working class, one needs a mass workers’ organization – a party of the working class. From everything I’ve read, the PSUV was not really a working class party; it was more built from above. I believe the comparison to the old Lazaro Cardenas of Mexico is valid in several ways. Included is how the both rested on the working class (and equally the peasantry in the case of Cardenas), granted major concessions to them, but balanced between the classes. What a Chavez regime may have become is a different question, but I don’t agree that he was a Stalinist in the sense that he rested on a state bureaucracy that came to power through the overthrow of capitalism. Venezuela remains a capitalist nation. The Venezuela is not socialist. It is non-capitalism apparent as indeed all other “socialism” real. Workers are not freely organized, the market and the state still dominate. But capitalism with a better distribution of income is better than a concentrator capitalism. If the US is a net exporter of Oil & Gas why the hell does it need Venezuelan crude. That’s not a right wing fantasy its a fact. I’m sorry that I do not accept that Chavez was a fighter for the poor, I would have though that Marxist would have called him a Bonaparte. One is not denying that homes hospitals and schools have been built but Socialism give me break. The regime incorporated all the best parts of Stalinism – vastly expanded bureaucracy that will become even more powerful in the months ahead. And why did Chavez go to Cuba or have to import teachers, and other skilled workers from Cuba. Cuba turned their education system in 5 years after the revolution. Why were no Venezuelan hospitals capable of treating Chavez? The whole point is that vast swathes of the educated class have not been drawn in and are actively hostile. Those that claim that if the workers lead all other classes will fall in behind are fighting the wrong revolution at the wrong time. You’ll have to ask the exporters, who have not shared their reasons for their business decisions with me. But I don’t believe I am going on a limb by suggesting that distribution decisions are based on what is most profitable. Bonapartism is a rather abused terminology. But, if we accept the term in its proper usage (i.e., Marx on Napolean III or Trotsky on Germany immediately before Hitler’s appointment), the term is a very poor fit for Chávez. A Bonapartist leader is someone who is placed in power by a ruling class or oligarchic ruling coalition to maintain a temporary balance between opposing social blocs. Chávez’s electoral victory overturned an established bourgeois order. Venezuela can be considered to be on a knife edge given its polarization (the pre-condition for a Bonapartist intervention), but here we have one social bloc that will seek to maintain itself in government, while the former ruling social bloc seeks to put itself back into political power (it of course has relinquished little of its economic power). There is no person or entity (falsely depicted as) “suspended” above politics or government, which is what a Bonapartist is, in the Marxist sense. Chávez unambiguously represents specific social groups, however much he had to (and his successors will have to) maneuver around Venezuela’s vengeful bourgeoisie, the middle class elements who tail that bourgeoisie, and the global imperialist interests seeking to restore the pre-Chávez status quo. However Trotsky also characterized the Soviet Stalinist regime as Bonapartist. Obviously, in no way can the Chavez regime be characterized as “Stalinist” in form, so we have to dig a little deeper to see the content of Trotsky’s characterization. Abstractly, “Bonapartism” can be defined as an attainment of a relative autonomy of the state institutions on the basis of striking an institutional balance between the contending classes of exploiters and exploited. However the institutional form of this “balance” was transformed from its general origins in the 19th century (the Cromwell regime in 17th century England can be seen as an early modern forerunner) into the 20th century, effected basically by the complete subjugation of the globe by what became a truly world capitalism by the end of the 19th century. Prior to this, “Bonapartism” had appeared as a balance of classes within a *single country* (in an aside, the U.S., and not France, was the pioneer in 19th century Bonapartism from 1789 onward, with the foundation of a limited, but *permanent* “Constitutional Bonapartism” institutionalized in both the Presidential Executive and “independent” Judiciary, from the Supreme Court on down. Both these institutions, taken by themselves, are entire autocratic. Thus the U.S. is the most successful Bonapartism, however limited, in human history). However with the opening of the 20th century and the era of the Russian Revolution, Bonapartist regimes took on a necessarily international aspect. If, in the “historically progressive” case, one leg of support rested upon the exploited classes within a single country, the other rested upon the internationally organized bourgeoisie via its institutions *outside* that single country. This new arrangement only really jelled in WW2, with the displacement of the “alternate Bonapartism”, fascism, whose project was the terrorist repression of the working class in every imperialist country (resting therefore on the non-proletarian “middle classes” relatively numerous in such countries), coupled with a reorganization of international capitalism away from its Anglo-French pole. In the event, that reorganization was carried out by the already Constitutional Bonapartist U.S. in a contradictory relation to the regime that had effected the defeat, the Stalinist regime in the U.S.S.R. Its international institutional connection with the U.S. was through the military-bureaucratic apparatus, one that proved extremely stable. (Another aside: In the Eighteenth Brumaire, Marx also noted that the French military was a “holdover” from the pre-revolutionary ancien regime. The Soviet case, though, was different, especially as the Red Army was created out of whole cloth by Trotsky himself! Hence the necessity of the *international* connection in this characterization. )The inevitable dissolution of the Anglo-French colonial empires led to similar 20th century type “anti-imperialist” Bonapartisms springing up like mushrooms throughout the post colonial world, including Latin America. Those that sprung up in the Arab world are now falling before the Arab Spring, as the internal mass basis for the regimes has evaporated together with the external basis after 1989-91. Chavez represents an interesting anomaly in this light. The Chavez regime is really one of the 20th century Russian Revolution era, but also a latecomer. For this reason its external institutional basis did not rest upon the contradictory relation with the imperialist center of world capitalism expressed in the military apparatus, even though Chavez came out of the military. Instead it rested upon the state-owned oil industry. This was the international relation with world capitalism that was counterbalanced with Chavez’s internal mass support to grant it relative stability. Hence, in what is in my view the blackest spot on Chavez’s record, its political affinity with the dying regimes of Ghadaffi and (now) Assad. And its affinity with the (not yet dying) Putin regime in Russia, whose new relation with world capitalism now rests upon the same basis as Venezuela: rents extracted from the world capitalist economy by means of export of natural resources. This explains why the Chavez regime has not invested in the creation of a skilled workforce. It is an economy that rests primarily upon rents, and not upon the productivity of its labor power. The social effect on labor power is the same economically – under a very different political regime – as with Saudi Arabia, where there reigns Koran obscurantism in place of science. It contrasts with Cuba, which can only depend on the skill of its working class, having few natural resources to extract rents with. Yes “Bonapartism” is much abused as a concept, but I think it has broader application than traditional allusions to its “temporariness” indicate. Capitalism itself is an inherently unstable, non-equilibrium system, and in fact “Bonapartism” in one degree or another can be seen as the typical political regime of capitalism: there has been so many of them in the 20th century! In fact today it is impossible that the tiny class of capitalists could rule all by themselves. They must find some mass basis od support outside themselves, mediated by some State institution. All bourgeois political regimes are then inevitably “a little bit Bonapartist”, and *the United States was the historical pioneer* in the establishment of this kind of regime in limited but permanent form. That’s a clue as to one of the secrets of the relative success and power of this state up until recent times. It is a really good analysis, looking at things like the crime issues that seems to be only present in really right wing media. Has someone translated this to spanish? We have a marxist study group in Chile and are really interested in doing that, because everyone here (and in latin america in general) only pay attention to the chavist discourse and very few are willing to analyze seriously the phenomenon (also, the analogy with Pinochet, although really broad, made many people angry here, haha). I tried to contact you privately but could not find any e-mail or info, that is why I ask here. I think the Chavez regime was/is similar in some ways to that of Lazaro Cardenas in Mexico in the late 1920s. There, on the heels of a workers’ upsurge including a mass oil workers’ strike, Cardenas nationalized the oil industry as well as other industries and also led the redistribution of land to the peasantry. He led the formation of the PRI, the party that ruled Mexico for many decades. The PRI at times rested on the working class and/or the peasantry and delivered blows to the capitalist class. At other times, it did the reverse. Of course there are big differences between Chavez and Cardenas, but there are also some similarities. It will be interesting to see which way his successor moves. In this sense, I think “bonepartism” is an accurate description of Chavez’s regime. He rose to power based on a layer of mid level military officers, lacking the organized support of the workers and without the support of the Venezuelan capitalist class. He moved to the left, resting on the increased activity of the working class. However, I don’t think he could be called a workers’ leader despite his mass support from the working class. For that to have been the case, there would have had to have been a mass working class party. Chavez did organize the PSUV – the United Socialist Party of Venezuela — but I don’t think that it’s possible to organize a workers’ party from above like that. The world situation also allowed Chavez to balance between world powers, in particular resting on Chinese capitalism to a great extent. I think there are some similarities here (with obvious great differences too) to the situation of the “non-aligned nations” during the cold war days.